The Google Pixel 3 Live Wallpapers have leaked online and are now available for download. 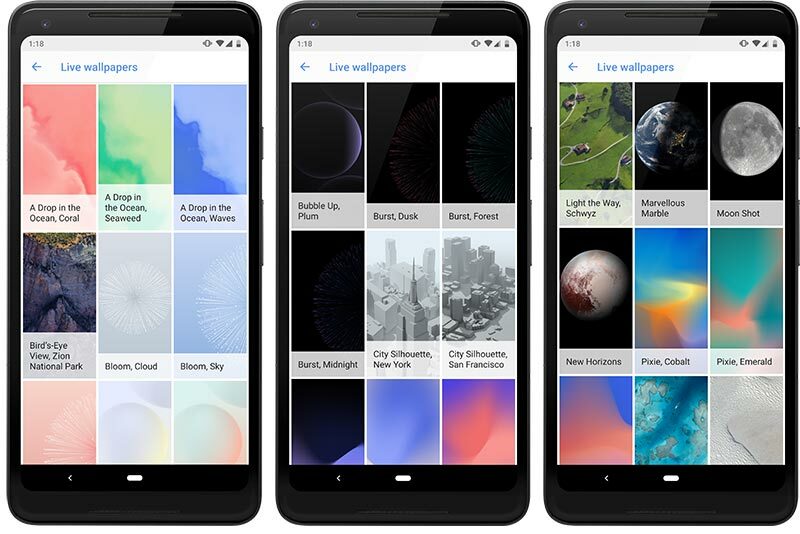 The wallpapers have leaked along with the Wallpapers app that is specific to the Pixel 3 phone. Now, the app has been ported to work with phones running Android 6.0 Marshmallow and above. You can now get a total of 28 wallpapers with the app. Pixel 3 is one of the most anticipated phones right now. We have been seeing a lot of hardware leaks regarding the phone and rumors about the specifications are spreading like wildfire. Even though a lot of us will not part with our existing phone in the near future, we all can get the live wallpapers from Pixel 3. The 28 wallpapers are divided into two categories: “Come Alive” and “Living Universe”. The former category consists mostly of minimal abstract wallpapers whereas the latter consists of nature scenes and bird’s eye view of places. The wallpapers in the first group include Bloom Cloud, Bloom Sky, Bloom Sunrise, Bubble Up Lemon, Bubble Up Peach, Bubble Up Plum, Burst Dusk, Burst Forest, Burst Midnight, Groove After Dark, Groove Chill, Groove Party, Pixie Cobalt, Pixie Emerald, and Pixie Periwinkle. The four wallpapers in the latter group include scenes from Zion National Park, Schwyz, Sonoran Desert, and Malolo Barrier Reef. The wallpapers were leaked via Twitter user @IshanAgarwal24 and mysmartprice. The images are available in 1080p resolution and higher. On most handsets, you will get them as static backgrounds. However, if you want the live wallpapers, in particular, you have to install another APK file separately. The download links are provided later on in this post. XDA developer Pranav Pandey ported the APK file to older devices. By default, these wallpapers are meant for Android Pie devices only. On Android Pie, there is a certain software library that allows live wallpapers to change the color of the System UI when the wallpaper color changed. This is called the WallpaperColors API. This was removed so that the live wallpapers work on older phones without any issues. The WallpaperColors API is not supported in Android version prior to Android 9.0 Pie. Furthermore, this APK works only with devices that run Qualcomm Snapdragon chipsets. However, not all phones running Snapdragon chipsets work with the ported live wallpapers either. So, if your phone has MediaTek, Exynos or Kirin chipsets, you may have issues with the live wallpapers. However, do feel free to test out the app, because it may work on your phone. To have the live wallpapers, you need to install the wallpapers first from the APK. Next, you will need the Google Wallpapers app. Moreover, you will also have to enable installation from unknown sources. If you do not have it enabled, you will be prompted when you try to install the APK file. Make sure that you get the correct version. Once you have downloaded and installed the APK files, you will see the live wallpapers pop up in the Wallpapers app. From there, you should be able to set it as your background. If you want to use the static version of the wallpaper, you can get them using this link. Google has been quite tight-lipped about the Pixel 3. However, you can be sure that these wallpapers will be there on the smartphone.